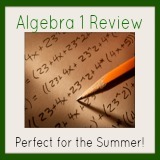 Algebra Class offers several products that will help you with your Algebra 1 program. Whether you are a teacher, homeschool student, public/private school student, or college student, we are here to help you. This online E-course was written for homeschool students, students going back to college, and students who truly struggle with math. It's step-by-step format is perfect for any student who wishes to master Algebra 1. You will start with the Solving Equations Unit and work your way through 10 units of the Algebra 1 program. For more detailed information on the program, please click here. This course if for students who have already taken an Algebra 1 or basic Algebra course and need to review the concepts for an upcoming course or exam. This course does include video tutorials and works through an entire Algebra 1 curriculum; however, it's a much faster pace with less practice than the Algebra Class E-course. For more information or to purchase this course, please click here. Algebra Class Worksheets! Now you can get all of the worksheets that are in the Algebra Class E-course. Teachers can use these worksheets with students. You'll have access to practice worksheets, answer keys, unit tests, mid-term, and final exams! This download contains all of the worksheets. No video tutorials are included. Click here for more information or to buy the Algebra Class Worksheets. This quick course if for students who are getting ready to begin an Algebra course and need to review integers, order of operations, distributive property, and like terms. You will also have access to the first unit (Solving Equations) of the Algebra Class E-course. This course is FREE. Click here to get started. 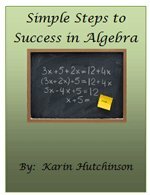 This workbook contains many of the Algebra 1 lessons on Algebra-class.com It is formatted so that you can easily print the pages without ads to ensure a clean copy of the examples. You will also have access to practice problems and step-by-step answer keys to each lesson. To purchase this workbook, please click here. I hope that my products have been able to help you with your Algebra studies. If you have question or concerns, please contact me at anytime.